Ultrabooks have been seeing bleak times after the emergence of tablets, but this time around they have made a comeback, and what a comeback it has been. According to Techwireasia Results from a research carried out by the GfK Group show a 248% rise in Ultrabook sales by the end of the first quarter. To keep up the momentum PC vendors are launching a new line of ultrabook/tablet hybrids next. "Global demand for ultra-thin notebooks have been seeing a consistent uptrend in the last four consecutive quarters which sold over 1.2 million units worldwide. Defined as notebooks 2 centimeters or less in thickness and weigh less than 1.5 kilograms, latest findings revealed over half a million of such devices worth nearly USD1.4 billion being snapped up in the first quarter of 2012 alone." This year Computex saw a host of ultrabook/tablet hybrids lined to hit the market in the coming months. One major factor for the sudden peak in sales is the lowered price ranges of the ultrabooks, comparing between this and the previous year. This is again boosted by the addition of latest specs and moreover, the OS is getting more and more attractive. Ms. Lydia Huang, General Manager of GfK Taiwan has observed that the reason behind the strong sale figures were due to the large number of choices available in the Ultrabook sector. Taiwan has seen Ultrabook prices go down, falling as low as 13% compared to last year. Lenovo alone has reported its sales to have gone up by 20% this year and Dell claims their sales have hiked by 25%. Arguably, the MacBook Air is considered to be some sort of a benchmark where ultra-thin notebooks are concerned and more or less, consumers and businesses alike want their own MAcBook Airs. 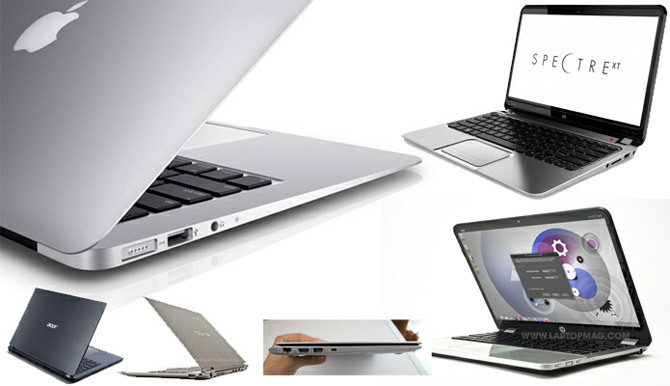 But given the price range of the MacBooks, consumers instead opt for an ultrabook of their choice. Ultrabooks can be prchased for a comparatively lower price and for a Windows user it is his/her own personal MacBook Air. According to Intel, PC vendors are expected to ship many more Ultrabooks this year which will hit the market with prices as low as $699. Anticipating a feirce competition from tablets, Ultrabook makers are already seeing efforts for their own line of ultrabook/tablet hybrids, which will come with the latest Windows 8 OS and the next generation of Intel's Ivy Bridge processors. Time sure does change with changing technology, but who's complaining? In the coming months we will be able to get both a tablet and an ultrabook converged into one and that too at the same time and price.